Set on the River Planet, this fantasy has an underlying message about the use and abuse of creation and humanity. Johin (accompanied by her pet mouse) takes on a quest set by a charismatic stranger. - Publisher Set on the River Planet, this fantasy has an underlying message about the use and abuse of creation and humanity. Johin takes on a quest set by the charismatic stranger, Manny, whose claims about the importance of the River of Life are not believed by all his hearers. 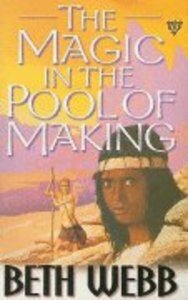 About "Magic in the Pool of Making"
Set on the River Planet, this fantasy has an underlying message about the use and abuse of creation and humanity. Johin takes on a quest set by the charismatic stranger, Manny, whose claims about the importance of the River of Life are not believed by all his hearers. BETH WEBB lives in Somerset with her four children and an entourage of pets. Her stories are mostly based on real places or events, intertwined with traditional folk legends. Her other novels for Lion Children's Books are The Magic in the Pool of Making, The Dragons of Kilve, The Witch of Wookey Hole and Foxdown Wood.